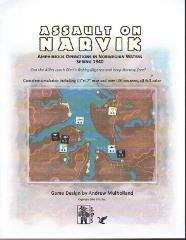 Assault On Narvik is a simulation of the ground, sea and air battles that raged around the far northern port of Narvik in Norway during the spring of 1940. Gamers can take both games and compare just how much each side learned about amphibious operations in the three years that separated the two battles. The game has an 11" by 17" map, 95 half-inch counters, 2 pages of charts and tables and 10 pages of rules. The game covers the Allied landings just after the Royal Navy went in and blew out of the water the German destroyer flotilla (that had just landed their troops). The game uses a clever mechanic that ties in units' Fatigue Levels whenever they perform any sort of operation (move, attack, defend, retreat, you get the picture). The terrain and weather were so inhospitable that units can get worn down pretty quick, and players have to be thinking ahead to win the game.